Lawrence of Arabia (1962) is one of the 1001 classic movies you should see. 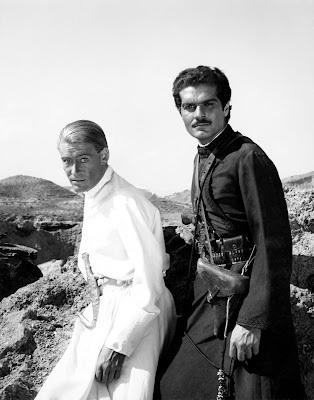 David Lean's World War I epic stars Peter O'Toole (left) and Omar Sharif. Each Friday, I'm going to recommend a classic movie you should see (for the reasons behind the 1001 series and reviews of earlier films covered go here). This month I'm commemorating the 100th anniversary of the United States' entry into World War I by covering four films about the conflict. This week's selection is director David Lean's epic Lawrence of Arabia (1962). Lawrence of Arabia tells the story of eccentric British Army Lieutenant T.E. Lawrence (Peter O'Toole), who, when the film begins, is bored with a dull desk job in Cairo. 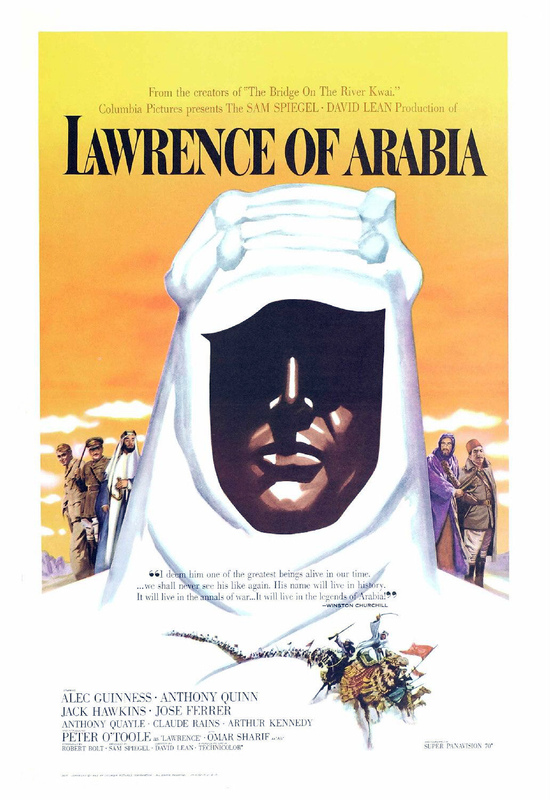 Over the objections of his commanding officer (Donald Wolfit), Lawrence is assigned to travel into the field and make a report about the military preparedness of British ally and Bedouin leader Prince Faisal (Alec Guinness). However, instead of following orders, Lawrence becomes the de facto leader of a guerrilla war against the Turkish army. Producer Sam Spiegel had long wanted to make a film about the life of Lawrence, but he finally got his chance in 1960, when Lawrence's family consented to sell Spiegel the film rights to his memoir, Seven Pillars of Wisdom. He and director David Lean then embarked on an arduous two-year shooting schedule that spanned three continents and went through several leading men before the relatively unknown O'Toole was cast as the enigmatic soldier. The result was a massive commercial and critical hit that won seven Academy Awards and remains one of the most influential films ever made. While Lawrence of Arabia is ostensibly about the Arab Revolt, it largely abandons the intricacies of actual history to focus on a character study of Lawrence, whom a bleach blond and heavily made-up O'Toole plays with an otherworldly charisma. In fact, Lawrence is portrayed as the first mass media star, who both revels in and is repulsed by his newfound celebrity status. He is a bundle of contradictions who, at one moment, poses like a supermodel in his Bedouin wardrobe, while in the next he is hiding his identity under an assumed name. 1. Historical accuracy. Many scholars dispute Lawrence of Arabia's historical accuracy, mostly because screenwriter Robert Bolt compresses much of the action and uses composite characters -- both the roles played by Claude Rains and Omar Sharif are based on several real people -- to make the plot more understandable to a general audience. However, the real dispute lies in the portrayal of Lawrence himself, who seems to have been a rather mysterious character even to his own family. 2. O'Toole. Several actors including Marlon Brando, Anthony Perkins, and Albert Finney were cast or were about to be cast when Lean spotted the theatrically trained O'Toole in the British crime film The Day They Robbed the Bank of England (1960) and immediately had him screen-tested for the part of Lawrence. The movie made O'Toole an instant star, and although he had a successful 40-year career in Hollywood, he never quite escaped Lawrence's long shadow. 3. Cinematography. Lean, cinematographer Freddie Young, and editor Anne V. Coates present viewers with one gorgeous desert vista after another. Watch for Omar Sharif's entrance scene and the train scene where O'Toole vamps in his traditional wardrobe. 4. Female roles. There are no speaking parts for women in Lawrence of Arabia -- in fact, women are only briefly glimpsed in the film -- which has led some to criticize the film for alleged misogyny. I've always found that line of thinking somewhat bizarre since the film deals primarily with Lawrence's life in the British Army, a largely male institution at the time, and in Bedouin culture, which had strict moral and social codes about the mingling of the sexes. 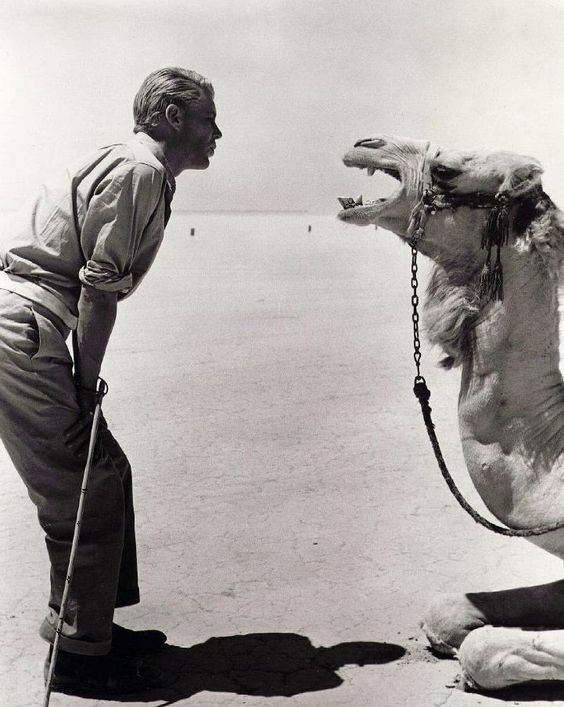 Peter O'Toole tries to make friends with an angry camel on the set of Lawrence of Arabia (1962). Other critics: Lawrence of Arabia has a 97 percent fresh rating on Rotten Tomatoes and Leonard Maltin writes that the film is "an epic film that is also literate" in a 4 star review for his Classic Movie Guide. Critics in 1962 mostly handed in raves. Judith Crist of The New York Herald Tribune raved that the film was an intimate epic, writing, "[t]o me, Lawrence is an extraordinary film because it accomplishes what no other medium can in presenting the story of that enigmatic twentieth-century hero. . .it is an extraordinary film because it is the first spectacular to use its spectacle for more than visual purpose, specifically as a probe of character, a delineation of an individual within a broad realm of experience." The New York Times Bosley Crowther had a slightly more negative take. While he praised the film for being "awe-inspiring" and "beautiful," he also felt its nearly four-hour length made it an exhausting "camel-opera." The Bottom Line: Lawrence of Arabia certainly has its drawbacks: First of all its looong (I recommend watching it in two parts) and second, there's some ridiculous casting (most notably Guinness and Anthony Quinn playing Arabs), but it is still absolutely essential viewing for any serious student of old Hollywood films. Watch it for the stunning cinematography, iconic score, and O'Toole and Sharif's star-making performances. Availability: Lawrence of Arabia is available for streaming for DirecTV subscribers. It is also available on Blu-ray, DVD, and video on demand. I'll be off next Friday to celebrate the Fourth of July, but I'll return July 7 to celebrate Robert Mitchum's centenary with a review of the seminal noir, Out of the Past (1947).